Valued for its strength, flexibility, and aesthetics, perforated metal is a popular material choice for commercial and residential architectural applications alike. Most often, perforated metal — also called perforated sheet, perforated plate, or perforated screen — is used for facades and exterior building design. But it’s also used in a huge range of other applications, from food and furniture to automotive and agriculture. To produce this unique metal, a raw material is coil-fed into a high-speed press. The metal is punched on the downstroke of the press, and the material advances on the upstroke of the press. The size, shape, and pattern of the perforations are custom-made, and will depend on the specific project and aesthetic requirements at hand. Few materials can achieve both the flair and functionality afforded by perforated sheet metal. Perforated sheets can be made from a variety of materials — stainless steel, coated steel, refractory metals, aluminum, copper alloys, zinc, nickel, and titanium, just to name a few — in order to work in conjunction with materials such as wood, natural stone, ceramic tiles, bricks, glass, and leather. This unique metal can also be manufactured in many different styles and patterns. Holes in the metal sheet can be round, diamond, hexagonal, or square, and are offered in various sizes. These holes can be arranged in a staggered or straight pattern. Perforated metal is very easy to clean and maintain, making it well-suited to both indoor and outdoor architectural design applications. It’s commonly used in facades, stair railings, balconies, ceilings, room dividers, stairways, and screens. Optimal aesthetics — There are countless customization options available for perforated metal products. Hole shapes, sizes, geometric patterns, and finishes can all be chosen to match the particular application at hand, making it easy to achieve a specific look. High versatility — Because perforated metal can be easily bent and configured to suit its intended application, it’s ideal for use as a lightweight decorative element or as a structural component in buildings. Sound absorption — Perforated metal is an excellent material for diffusing sound. For example, it can play a key role in eliminating frequencies in sound-filtering systems, such as enclosures surrounding large air-conditioning or compressor units. Superior ventilation — The openings in perforated metal permit the passage of light, air, heat, and gases. And by allowing for a balanced level of natural lighting during the day, perforated metal reduces the amount of artificial light needed, while deflecting heat at the same time. Adding visual interest to buildings’ exterior, perforated metal allows occupants to enjoy views while still maintaining privacy. Durability — Thanks to its high strength-to-weight ratio, perforated metal can also control or equalize pressure, allowing it to easily withstand harsh weather. Plus, the perforations reduce the material’s overall weight, meaning buildings’ frameworks have less to support. To learn more about perforated metal or discuss options for your next architectural design project, contact the experts at Metalex today. What Factors Should You Consider for Your Speaker Grille’s Design? Extensive design and engineering is involved in the manufacturing of a speaker grille to protect and support the sound quality of the speaker. That’s why Early Supplier Involvement (ESI) is critical for speaker grille applications. ESI provides better collaboration between the manufacturer and the supplier to deliver better quality, lower costs, and faster development. Metalex has over 50 years’ experience in the expanded and perforated metal industry. Our team of talented engineers and range of operation capabilities offer the audio industry a one-stop shop for their speaker grille design. Our team collaborates to ensure that the pattern and material chosen are ideal for the aesthetic and functional requirements of the design. Metalex is the ideal partner for speaker manufacturers. Speaker grilles are protective measures critical to the home, automotive and professional audio industries. Speaker grilles are designed to protect the inner workings of a speaker — the cone, tube, and delicate electronics behind them, without distorting the sound quality. With careful consideration throughout the design and manufacturing process, you can achieve an appropriate balance of protection and sound quality. While a harder protective element can provide stronger protection, a speaker grille material that is too hard won’t flex with the sound waves. The lack of flexibility in the grille can actually damage a speaker, instead of protecting it from damage as intended. Choosing a material of the appropriate density achieves both protection for the components and flexibility for sound production. Speaker grilles have perforations by necessity — sound vibrations must be able to travel from the speaker tone to the listener. A solid sheet of metal, even a very thin one, would drastically impact sound quality. A quality speaker grille design incorporates a high percentage of open area through the pattern of perforation and bar size to achieve unaltered sound, while providing protection for the inner workings of the speaker. Engineered metal is a key element in many architectural projects. Metalex engineers work with architects and designers to develop the appropriate pattern and style to meet the demands of almost any project. Our coil-fed processing and breadth of manufacturing capabilities allow us to efficiently produce safety grating, security fencing, sunshades, facades, and ceiling panels for architectural applications. There are an astounding range of applications for converted sheet metal. From the most utilitarian functional walkway to an artistic accent, the possibilities are endless. Perforated metal is produced when a raw material is coil-fed into one of our high speed presses. The metal is punched on the downstroke of the press and the material advances on the upstroke of the press. The size, shape, and pattern of perforations are manufactured according to your needs and precise aesthetic purpose. Strokes can be skipped in order to create gaps or margins perpendicularly across the material, and sections of punches can be gagged to create a parallel center margin or rectangular element of un-punched space within the pattern. Safety grating is produced when a raw material is coil-fed into a heavy duty die press. However, safety grating is produced exclusively in a coil-to-sheet process: a coil feeds the machine and a cut to be made at a set length upon exiting the press. Metalex offers a unique programmable die which allows for sections of the pattern to be gaged and angles or unique shapes to go punctured through the press. Expanded metal is produced through a coil-fed process in which raw material is simultaneously slit and stretched creating uniform diamond-shaped openings. Expanded metal can be recoiled or blanked into sheets depending on the desired end use. Metalex offers inline flattening and inline slitting on our expanded metal production lines. Metalex’s expertise on engineered metal for architecture was recently in Engineering.com. Read the article for more information. Metalex provides versatile perforated metal products practical for use across a range of industries. Our customizable tools allow us to meet a great variety specification and make the ideal product for your application. Whether it is industrial grain drying or home lighting fixtures we provide a cost-effective and reliable solution for your project. Perforated metal is used in acoustical enclosures, speaker grilles, and filtration as well as numerous applications in the pharmaceutical, agricultural, and home appliance industries. Our state of the art equipment allows us to meet the tolerances of nearly any project, pattern or material. You can count on our engineers and technical experts to work with your team to develop the perfect product. For all perforated projects it is important to consider the material used, the percent open area, as well as the shape, size and pattern of the perforation. Metalex has the ability to perforate brass, copper, aluminum, hot or cold rolled steel and even plastic. We build our own tools allowing up to produce the perfect perforation for your end product. Perforated metal products can bring you efficiency and aesthetics at accessible costs. 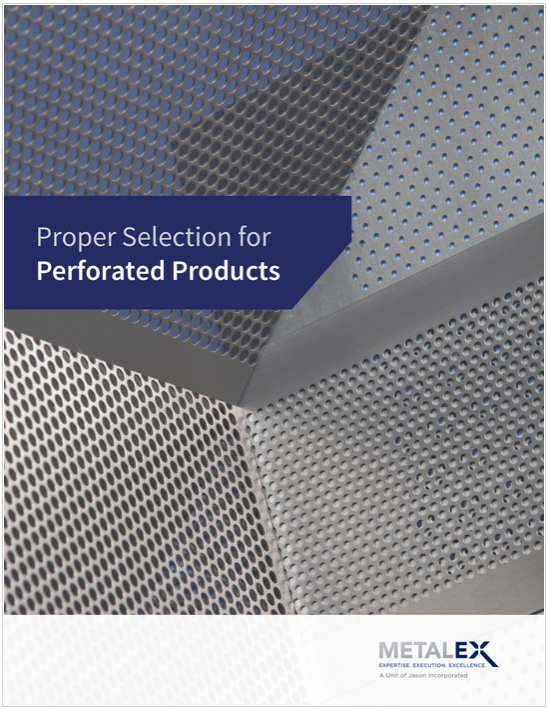 Click the button above to download our eBook, “Proper Selection for Perforated Products” to learn more about choosing the right perforated product to meet the form, fit, and function of your project. A simple sheet of perforated metal can serve many architectural functions in an effective and cost-efficient manner. Perforated metal is used in everything from acoustical applications, outdoor furniture, balustrades, and many more. Once you know where to look, you’ll find that perforated metal is a commonplace element in the construction and development of entire buildings. Consider using perforated metal for the following, key architectural applications in your next building design. In acoustical applications, perforated metal can be utilized in two different ways. It can serve as a facing for acoustic material, or as a part of a tuned resonant absorber. In the first example, a perforated metal sheet is positioned over a sound-absorbing, or sound-reflecting, material and is used as a protective or decorative covering. In the second case, the panel is designed with a specific thickness and number of holes to remove sounds in a certain range of frequencies. Perforated metal is commonly used to build outdoor furniture, such as benches, picnic tables and garbage cans. Aesthetically, perforated metal has a modern appeal and does not visually obscure surrounding scenery. Practically, the perforations allow rain and fine debris to drain away, rather than collect on the surface. Perforated metal is durable, so it can endure harsh environmental conditions and strong winds. Unlike wood, moreover, it does not require yearly maintenance to prevent warping. Many building façades and staircases are also built from perforated metal. As a façade, perforated metal is an efficient sun protection system. The metal delivers UV protection while permitting light and air to filter through. Like perforated metal furniture, staircases built from this material are ideal for outdoor use because they allow rainwater to drain away. This is especially desirable from a safety perspective, as puddles of water can cause people to slip and injure themselves. Perforated metal panels provide an ideal ventilation filter for HVAC systems. The gauge, size, and hole pattern of a perforated metal vent will vary based on the specific application. However, a properly designed vent will enhance the efficiency of any heating, ventilation or air conditioning system. Perforated metal vents distribute air evenly for uniform room temperatures, reduce noise pollution from fans by breaking up airflow, and conceal filtered media in a visually pleasing container. Suspended ceilings made from perforated metal are available in a variety of designs, textures, and colors. In addition to its decorative appeal, these panels are easy to install, provide sound-proofing benefits, and conveniently cover unsightly ducts and pipes without restricting access for regular maintenance. Lightweight and durable, suspended ceilings made of perforated metal are commonly installed in commercial buildings and residential homes to add value to an interior space. Perforated metal panels are also used to make eye-catching and durable balustrades. Designer balustrades made of corrosion-resistant perforated metal improve the safety of balconies and stairwells. They also provide some degree of privacy while allowing sunlight and air to pass through. Just as with perforated metal suspended ceilings, these balustrades come in a range of beautiful designs and colors to suit the aesthetic of any building or home. As the examples above suggest, there are a myriad of uses for perforated metal in the architectural space. Perforated metal is not only practical, but also visually appealing. It can be used to shield everything from the sun’s harsh rays in an office building, to dust and debris in an HVAC system. It can be an elegant design solution for the home, and a durable material for outdoor and recreational spaces. For more information about perforated metal for your specific project, please contact the experts at Metalex today. What Are Perforated Tubes and How Do You Select the Right Ones? Perforated tubes are metal tubes that have holes or slits punctured through the wall to enable liquids or air to enter or exit the cylinder. Filter applications such as oil filtration are the most common use of perforated tubes, although they are also frequently utilized for underground drainage. Additionally, vehicle mufflers commonly employ perforated tubes when needing to reduce engine sounds and filter exhaust gases. Due to their practical and aesthetic features, perforated metal tubes are very popular among architects and designers. That’s why you’ll find them being used in lighting fixtures, conduit ducts, safety guards, and other interior design elements, in which they allow light or air to be exchanged or to dampen sound or noise. Perforated tubes come in a variety of patterns, styles in the perforations, and seams of the tubing. Metalex offers two primary seam designs for perforated spiral tubes: the flush (outside) and inside lock seam, which is popular for use in fluid filtration; we also offer a unique spiral louvered design with a flushed lock seam, used as an alternative to the straight seam tube when a weld is not required. Other seam designs include various welded and abutted options. Perforated tubes come in a variety of materials to meet the requirements of the specific application. Materials used in the manufacture of perforated tubing include: tin plated, galvanized metal, stainless steel, brass, and aluminum. The material used will be application-specific based on the demands of the environment or the aesthetics required. For example, perforated tin plated metal tubes are used primarily in filtration type applications. While perforated stainless steel, brass, and aluminum tubes lend themselves to use as architectural elements. When selecting a type of perforated tubing for a particular application, our customer service representatives are available for commercial advice. To learn more about our perforated products, access your copy of our guide Proper Selection for Perforated Products by clicking here or the button below. Perforated tubes and other perforated products are widely used in a myriad of filtration, dampening, exhaust, drainage, and other industrial applications. Holes contained within perforated products are created using a combination of standard and/or custom punches, CNC punching pattern software, and special fabrication techniques. The size of the holes in the perforated tube or other product is typically determined by the application—for example, by the size of contaminants the tube must filter out. Perforated metal is common as interior design elements, in which they allow light or air to be exchanged. They may also be used to dampen unwanted noise. Perforated tubes come in many different patterns. Ultimately, the design and application requirements will determine the perforation styles, or if the seams of the tubing contain perforations. Metalex offers two primary seam designs for perforated spiral tubes: the flush (outside) and inside lock seam, which are popular for use in fluid filtration. We also offer a unique spiral louvered design with a flushed lock seam, used as an alternative to the straight seam tube when a weld is not required. Other seam designs include various welded and abutted options. The material will be application-specific based on the demands of the environment or the aesthetics required. For example, perforated tin plated metal tubes are common in filtration type applications, while perforated stainless steel, brass, and aluminum tubes are used as architectural elements. Round Holes. A round hole is the easiest and most economical shape to incorporate into perforated sheet metal, as the relative simplicity of machining a round piece results in low manufacturing costs. Round hole patterns are used in a variety of applications, including air-conditioning and heating systems and decorative finishes for architectural installations. Square Holes. Square holes provide a significant amount of open area and a clear view through finished sheets, while also offering a strong barrier that can be used to resist impact loads, prevent contact with equipment, or prevent entry of trespassers into protected areas. Increased wear on equipment occurs during the square hole perforation process due to the tendency of the punches to experience increased stresses near the corners of each square shape. For this reason, the creation of square hole patterns has increased costs over the production of round holes. Straight line and staggered patterns represent the most common designs used for perforating metal. These fit the majority of perforated metal uses. Non-standard patterns are also available for custom applications. Straight Line. Straight-line perforated metal layouts consist of repeating rows that contain an identical number of holes in each row and follow the same alignment down the sheet as it is pulled through the punch. Straight patterns are designed by specifying both the distance between holes and the distance between successive rows of holes. Staggered Layouts. Staggered layouts consist of repeated patterns that offset alignments of adjacent rows as the sheets are pulled through the punch. Staggered layouts are specified based on the angle between centers of successive lines of holes. For instance, one of the most common patterns is a 60° staggered pattern. This means that after one row of holes is punched, the die moves over and punches the next row, so the line drawn from the center of a shape on the previous line to the center of an adjacent shape on the new line forms a 60° angle. Non-Standard. Non-standard patterns—such as circle, spiral, and star patterns—increase the cost of the perforation process, primarily as a result of the increased production time required to create these layouts. As with the hole shapes, utilization of patterns that are relatively symmetrical can reduce the overall cost of the perforated sheets. Hole shapes and patterns have a sizeable impact on the cost and performance of your perforated product. Knowing these specifications helps eliminate roadblocks when you bring a project to a manufacturer. To learn more about the qualities of perforated products, download our free eBook, Proper Selection for Perforated Products. Metalex, a Jason Company, was founded in 1962 and has grown from a small one-machine operation to a prominent member of a global group of manufacturers. We are dedicated to providing our customers with the highest quality products at the lowest possible cost. When you’re selecting perforated tubing for a particular application, our customer service representatives are available to offer advice on appropriate choices for any industry or application. To learn more about our perforated products and how Metalex can help you achieve significant efficiencies and cost reductions in your operation, contact us or request a quote. Perforation of material is accomplished by using mechanical means to penetrate, or “punch”, through material surface, leaving behind a hole of particular size and shape. In practice, perforated material typically consists of flat sheets that are modified by creating recurring patterns of punched shapes. Implementation of perforated products into any project requires knowledge of the cost implications associated with specific metal configurations. It is important to understand the various characteristics of a sheet and the options available when specifying the product to be produced. Material thickness is also important to consider, especially since the cost of fabricated pieces is typically derived from the “per pound” price of the material, and perforated pieces are no exception. The thinner the perforated sheets, the less material used to create the finished piece, and therefore the lower the price per piece. In addition to simply saving on material cost, it is easier for shops to punch and work thin(ner) sheets than it is to machine thicker pieces, which creates an associated savings in production costs as well. It is important to remember, however, that decreasing the cross-section of the sheets by choosing a lesser thickness will create a decrease in the structural capacity of the sheet. Utilization of higher-strength pieces can, in some cases, result in an overall reduction in the number of pieces that are required. The designer must balance material thickness versus structural requirements to ultimately decide on the best way to achieve a cost-efficient project. Perforated product producers are able to create a wide array of hole shapes and patterns in material sheets through the use of standard and custom punches, computerized punching pattern programs and special fabrication techniques. The types of hole shapes available in perforated products is limited only by the technological ability to machine the cutting dies into a specific configuration that can not only create the shape, but withstand the stresses of the punching process. A round hole is the easiest and most economical shape to incorporate into a perforated sheet, as the relative simplicity of machining a round piece results in low manufacturing costs. Hole size is determined by drawing a circle around the hole shape with a radius that extends from the center of the shape to its extreme outside edge. Typically the hole size is greater than or equal to the thickness of the material being punched, in most cases much greater. For high-strength material such as stainless steel, the hole size must generally be at least 2 to 3 times the thickness of the metal sheet in order to provide a clean cut, easier manufacturing and reasonable cost. The end margin width on perforated sheets is normally zero, which means that there is no distance between the perforated patterns and the end of the sheet. This is known as an “unfinished pattern” and occurs when the punching continues to the ends of the sheet and the holes do not complete their last cut cleanly inside the sheet borders. Stock sheets are most commonly available in an unfinished pattern configuration. It is also the least expensive way to fabricate a piece from scratch. If desired, a minimum margin width can be created on the ends, but require adjustments to the perforation process, resulting in more expensive sheets. Knowing the exact specifications of your perforated product can help accelerate the project’s completion — and lets you know what to expect in terms of cost and timeline. To learn more about the factors that go into selecting your product, download our new eBook, Proper Selection for Perforated Products.